This pre-built rig will play almost anything with consistently excellent results. The chic Fusion Blizzard will play almost anything at a consistently good quality with excellent frame rates and resolution to match. An i7 CPU might have helped future-proof this pre-built machine, but that’s one of the only criticisms we can muster against it. While some may see the building of gaming PCs as the best and most flexible option, there’s no denying that the pre-built market is filled with attractive models chock full of great components. 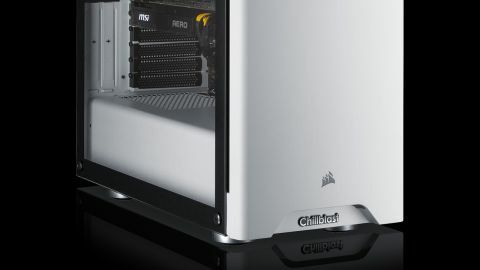 British-based company Chillblast has a great rep in this area thanks to a solid list of entries that cover a range of prices and specs, so we were delighted to welcome their Fusion Blizzard gaming machine into the office to give it a thorough going over. This model sits roughly in the middle of their entire range; although it's not packed with high-end hardware to create an over-the top-build, it does a good job of balancing cost and components so it can spend any ‘leftover resources’ elsewhere—namely, the graphics card. Before we get into the meat of its performance, though, it's worth noting that we tested the Fusion Blizzard on a ViewSonic monitor with 144Hz refresh rate and standard full HD resolution, which it handled well. To elaborate: its i5-9600K processor is more than capable, and the RTX 2060 GPU (teamed with 16GB of DDR4 RAM) really set it up for success. These specs had us quietly confident before we got going. We started by kicking the Fusion Blizzard into the deep end; we installed Metro Exodus and ensured everything was (metaphorically) turned up to 11: quality on Ultra; Vsync on full; Ray-tracing on high; and DLSS, hairworks, advanced physx, tessellation and texture filtering all on as high as they go. The system handled this reliably with no tearing, stuttering, or juddering. According to Nvidia’s tracker, it rarely dipped below 60 frames per second—even in the busiest and most frantic scenes. Just to get a good spread, we installed and played a variety of games like Skyrim Special Edition (which ran beautifully on ultra settings at its locked 60fps), Total War: Warhammer, and Elite Dangerous as well. The latter was incredibly smooth, running almost without a dip in quality anywhere or at any time. It hovered consistently at the top frame rates, and we saw 140fps in combat-filled hustle and bustle. Similarly, Total War operated at a buttery-smooth 100fps during battles. While the fps did start to vary wildly when zooming in on hectic hand-to-hand fighting, it wasn’t enough to be too noticeable. We tried the Fusion Blizzard with battle royale of the moment Apex Legends as well, and the system never blinked. In fact, it provided a rock-steady, constant experience with the framerate flying high above 100 fps. Its settings were locked on maximum once again, and this rig handled them all without breaking a sweat. It’s worth mentioning that we didn’t spend much time waiting, either; this is a nippy machine that enthusiastically whips through load times, thanks to the 250GB SSD, which comfortably held the suite of games we installed. We were up and playing less than 20 minutes after getting the Fusion Blizzard out of its box, so don’t expect to spend much time looking at loading screens. Anyway, let’s talk numbers. Behind the actual running and playing of games, the components inside genuinely do check out. They also complement each other to make a respectable gaming rig. To make sure of this, we ran some of 3DMark’s benchmarking tests. The Fusion Blizzard got a score of 7372 (better than 72% of all tests) on Time Spy and a score of 16814 (better than 86% of all results) on the Fire Strike test. According to 3DMark’s website, that puts this machine at the higher end of systems currently being tested and recorded on the database, including some listed as pure 4K gaming PCs (in the Time Spy test). Obviously the Fusion Blizzard won’t score anywhere near the high-end models and mega custom builds, but it gives a strong indicator of its place and where it’s pitched nonetheless. Perhaps this shows a very slight downturn compared to if the Fusion Blizzard had an i7, but that’s nitpicking more than anything else. The Fusion Blizzard is a powerful and supremely competent gaming PC, of course, but it seemed prudent to use it for day-to-day normal tasks for long periods as well—just to complete the package. Unsurprisingly, it excelled and has all the necessary bases covered. While the i5 may struggle with some creative and editing software, it’s fine for day to day use outside of these programmes. For us, it did everything that was required of it for long periods of time. What’s more, it was easy to appreciate its speed and efficiency when installing and updating programs and software or transferring files. Plus, it only ever gives off a standard hum of fan noise, putting it on the quieter side of pre-built PCs. That’s true to its sleek, unassuming aesthetic. The Corsair case is particularly pleasing and chic, giving an air of quality straight out of the box. Indeed, the only break in its crisp white shell is a cool glass panel on the access side, letting you get a good look at its snazzy RGB-lit innards. The Fusion Blizzard also boasts a sturdy and stable design with broad, circular feet that ensure the tower won’t be budging even if bumped. Meanwhile, the front-facing ports (including a couple of USBs, mic, and headphone port) are all on the top instead of the very front face, which is literally fine and actually makes for a more compete aesthetic. As you’d expect, the Fusion Blizzard adds to this with a whole host of ports on the back. There’s one DisplayPort, two HDMIs, the usual audio, mic, and ethernet ports, and more USBs (including one USB-C) than you can shake a stick at—7 in total. The tidiness and availability of ports on the outside is enhanced somewhat by excellent cable management. It’s incredibly well designed and laid out, meaning any future ventures within will be straightforward and should result in a winning connectivity combination of cables and ports forevermore. Happily, all this is decent value for money. Whereas pre-builts can sometimes feel like they’ve added an enormous premium just because they've screwed things together for you, this one actually feels tempting for its list price of $1900/£1450. Chuck in a 5-year warranty (covering everything for the first two years, then postage and parts are your responsibility in the latter three) and you’ve got a solid package from a well-respected manufacturer and company that you can have confidence in. So, is the Fusion Blizzard worth it? Generally, the short answer is ‘yes’. We would have no problem recommending this machine as a pre-built gaming PC that will last you 3-4 years, but it leaves plenty of room for future expansion should you wish to boost it after purchase. The graphics card is low end 20-series, but it will handle ray tracing; and there’s a healthy amount of RAM. The CPU goes to show that an i5 is still reliable in gaining top-end gaming results (however, an i7 may have been a better choice for future-proofing). This is a very capable, reasonably-priced gaming machine that will cater for most gamers, playing almost anything at a consistently good quality with excellent frame rates and resolution to match.